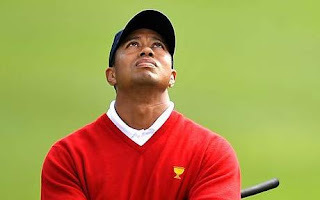 Earl Woods, Tiger's dad, once said: "He's qualified through his ethnicity to accomplish miracles. He's the bridge between the East and the West. There is no limit because he has the guidance. I don't know yet exactly what form this will take -- but he is the Chosen One." "The Chosen One?" -- How pretentious is that? You won't even find something this magniloquent or ostentatious in a Tim Tebow press release. 2. The Mayor of Las Vegas predicted a similar boost for the local economy. With many of Woods' alleged lovers having links to Sin City, and with Woods well known in Vegas casinos and nightclubs, Mayor Oscar Goodman said all this publicity, "would provide a boost to the local economy even if people no longer believed that what happens in Vegas stays in Vegas." Who can argue with the Mayor? Clearly what happens in Vegas stays in Rachel, Jaimee and Kalika. 3. Even other sports were affected by the Tiger sweepstakes saga. For example, a horse at Hollywood Park named Driveliketiger finished third in a recent race. The horse apparently did not hit anything along the way -- maybe Tiger should get a Jockey as a stocking stuffer this year. 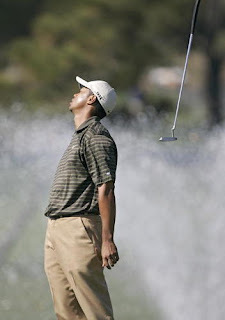 The ultimate irony, of course, is that Tiger Woods spent almost all of his entire life keeping score on the golf course. Now people everywhere are keeping score on him. What is Tiger's favorite Christmas Carol? "I'm dreaming of a White Mistress." How does Tiger like his women? Just like his golf balls -- white, with dimples. Tiger said the fault for his accident was his Escalade. That's oh-so typical of a golfer -- always blame the caddy! Will there be more to come? As Sarah Palin would say, "You betcha!"